9 Copycat Dessert Recipes: Easy Dessert Recipes to Make at Home free eCookbook is a fabulous collection you'll want to consult time and time again. All year round, people love enjoying warm and gooey dessert recipes; there are so many recipes for all of the seasons. This free collection is full of the best dessert recipes inspired by your favorite restaurants that you can make at home. These scrumptious, easy desserts are the perfect solution for easy entertaining for a large group at a party or for treating yourself to a delicious and inexpensive treat any time you feel like it. These simple dessert recipes are so fantastic and versatile, you’ll be able to reference this collection for inspiration all year round. AllFreeCopycatRecipes.com presents a list of homemade recipes that is sure to satisfy your family and will knock the socks off your guests at your next get together. Let dessert recipes “take the cake” at any event or gathering with the help of these copycat recipes from your favorite restaurants. Show off your talents as a master baker with this clever of seriously sweet recipes inspired by your favorite desserts inspired by your favorite brand name foods, including Cracker Barrel, Haagen Dazs and amazing restaurants like The Cheesecake Factory. Thanks to our free eCookbook, 9 Copycat Dessert Recipes: Easy Dessert Recipes to Make at Home, you can enjoy a variety of copycat drink recipes that are just perfect for any occasion. You will love them and so will the members of your family joining you to taste test your latest creations. 9 Copycat Dessert Recipes: Easy Dessert Recipes to Make at Home features some of the most wonderful and top-secret copycat recipes around, which also happen to be our readers’ favorite recipes as well. In this free eCookbook you’ll find recipes for Homemade “Hostess” Cupcakes (p. 6), Copycat Lemon Neiman Marcus Bars (p. 12), Copycat Cracker Barrel Coke Cake (p. 16) and many more perfect simple drink recipes for summer! Next time want to bake up something sweet that’s inspired by your favorite restaurant or brand, consult our free eCookbook. For more fun and easy copycat recipes, be sure to visit AllFreeCopycatRecipes.com. While you’re there, subscribe to AllFreeCopycatRecipes’ free Crazy for Copycats newsletter to get free recipes delivered to your inbox every week. Download your copy of 9 Copycat Dessert Recipes: Easy Dessert Recipes to Make at Home today. Dessert is the best part of the meal, don't you think? Sure, it's important to eat your meat and veggies, but when it comes down to it, a great dessert recipe is often the star of the show. Restaurants are famous for having decadent desserts in every sort of flavor imaginable. Do you love chocolate cake recipes? In our free eCookbook, 9 Copycat Dessert Recipes: Easy Dessert Recipes to Make at Home features an unforgettable copycat Cracker Barrel cake with an unexpected twist. Copycat Cracker Barrel Coke Cake (pictured) is an easy dessert recipe with loads of Southern flair and made with a very special ingredient...Coca Cola! Your friends and family are sure to get quite a kick out of this scrumptious dessert recipe. Cheesecake Factory is famous for...you guessed it...their wide array of cheesecake recipes. They run the gamut from decadent and sinful to light and tropical. No matter which cheesecake you choose from the menu, you really can't go wrong. In our free eCookbook you'll find a cheesecake recipe that is just perfect for summer as well as all year round, Copycat Cheesecake Factory Key Lime Pie Cheesecake. Personally, key lime pie is my favorite flavor as far as pies are concerned. Cheesecake and pie recipes are great because you can either make a delicious dessert recipe from scratch or you can pick up a tasty crust conveniently at the grocery store. If you're in the mood to try a cake recipe that's a little bit more decadent and very trendy, be sure to give Copycat Cheesecake Factory Red Velvet Cheesecake. The cream cheese frosting puts this recipe over the top...it's just too good! Whenever you are out shopping at the mall, do you ever get hunger pangs? I certainly do. I love stopping by the food court or a department store to pick a quick bite with a little bit of sugar. In our free eCookbook, we have an amazing dessert treat inspired by one of the most high-end department stores in the country. 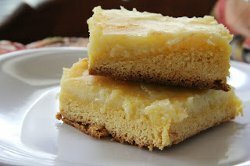 Are Copycat Neiman Marcus Lemon Bars (Pictured) expensive to make and enjoy? Absolutely not? This is one of the best dessert recipes, made lighter with that hint of lemon flavors. If you like chess squares, these dreamy little dessert bars will soon become a new hit in your baking recipe rotation. Last year, there was quite a lot of drama around the Hostess company closing. No more Hostess Cupcakes? No more delightful, bite sized treats? 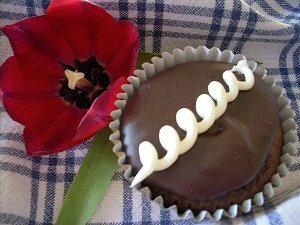 Never fear, because with this free eCookbook, 9 Copycat Dessert Recipes: Easy Dessert Recipes to make at home, we have a "Hostess" Cupcake Recipe that just can't be beat. While this little treat requires some baking skill in the kitchen, you will be rewarded with a knockoff version that tastes just like the original, if not even better. Get the party started by crafting these cute cupcakes for your next party, get together or even for a community bake sale. Download your copy of 9 Copycat Dessert Recipes: Easy Dessert Recipes to Make at Home. Next time you’re itching to go out to a fancy dinner to enjoy an even fancier dessert, consider making some of these brand name, simple to enjoy dessert recipes at home. Famous dishes like these are a snap to recreate at home, whether you're in the market for something sweet, something a little light or anything else you can dream up. Easy cheap dessert recipes recipes and trest ideas are right at your fingertips with our free eCookbook, 9 Copycat Dessert Recipes: Easy Dessert Recipes to Make at Home. Sometimes when I am standing in the line at a grocery store, I can't resist "the impulse buy". You know how it goes...you see that candy bar while waiting to ring up your groceries and the alarm goes off in your head..."I MUST have it!" In this free eCookbook, we have a few ideas inspired by grocery store recipes that will help you steer clear of impulse cravings because you can make these sweet treats at home. 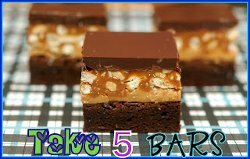 Copycat Take 5 Bars (Pictured) are one my all-time favorite recipes. It's just a treat with so much to love! Pretzels, peanut butter, chocolate, all with a satisfying crunch? Talk about a dream dessert. Now you can whip up this fun and fast treat in the comfort of your own kitchen to share with everyone. Who says summer is the only time for ice cream. If you are looking for a light dessert with a lot of flavor, Copycat Haagen Dasz Raspberry Sorbet is just the ticket. Sorbet is a great alternative to ice cream for those who are watching their waistline or are just not in the mood for anything heavy, indulgent or decadent. Great sorbet recipes like this are ideal following a light dinner of salad and perhaps even a glass of wine. You'll feel like you are relaxing on a tropical island when you enjoy the sweet and tart flavors of this truly refreshing dessert recipe. For more great brand name desserts, be sure to check out our free eCookbook, 9 Copycat Dessert Recipes: Easy Dessert Recipes to Make at Home. Download your copy of 9 Copycat Dessert Recipes: Easy Dessert Recipes to Make at Home! Four weekly emails with copycat recipes, tips, collection pages and more. As a crafty and creative cook, I know you can see the value in this free eCookbook. Practice your skills making a recipe for a homemade version of your favorite name brand recipes by trying out our famous brand name recipes. Our tastefully simple copycat recipes prove that cooking brand name recipes at home is quick and easy and super gratifying! So mark a few items off of your list of brand name food products and trying making your favorite brand name recipes at home. Woolworth made an apple dumpling with a white cream sauce, can anyone tell me where I can find this recipe? the white choc raspberry truffle cheesecake recipe does not tell you how much raspberry preserves to melt. I assume that some of these will be good recipes. Hope to try some soon.